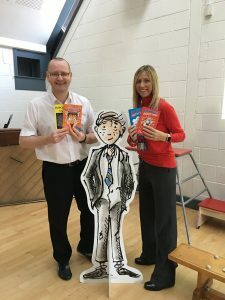 I spent fifteen years at Layton working as a teacher, so it’s always extra special when I return to share my books with the pupils. 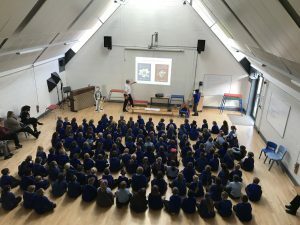 Over three-hundred KS2 children listened attentively for nearly fifty minutes as I explained the writing and illustrative process that went into making Danger Zone. They saw all six drafts of the story and Martin’s illustrations at various stages of development. 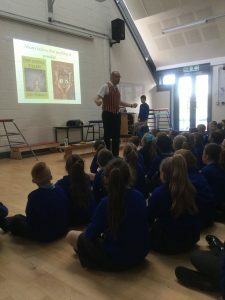 It wouldn’t be a complete school visit if I didn’t share one of the Impossible Tales. I put on the storytelling waistcoat to perform one of the more recent Tales. It features a crime-fighting wig and got plenty of laughs. Ace! 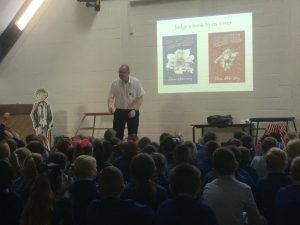 It was lovely to return later in the week to sign some books. I even got to spend a little bit of time with the members of the reading club, which was really lovely. Big thanks to Mrs Jones for organising the visit and helping to effectively promote the signing.